Michael F — Ascend P.T. I've been to numerous physical therapists in my lifetime and Heather at Ascend is hands down the best I've ever seen. There's not even a close second. It's like she can see into my injury and knows exactly what I'm feeling as she manipulates my body to do what it's meant to do. She's kind, friendly, and professional. 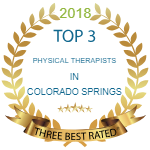 The thing that really sets Ascend Physical Therapy apart from all other PT businesses I've ever seen is their attentiveness to their patients. Every visit, every time, is one on one. There's none of this "warm up on the bike, and I'll give you some exercises to do and come back and check on you" while the PT then goes and works with one or two other patients. That is unheard of at Ascend. It's just not their methodology.